In my late teens I often dreamed about moving to Japan. I longed to experience different colors, shapes, and tastes, and felt a strange, visceral attraction to Japanese style and culture. I pictured myself living in an old regal city like Kyoto, surrounded by temples and shrines, losing myself in a sea of red maples and blossoms. I ended up working in a Japanese company for nearly a decade, which was altogether a good thing, but my urge to relocate eventually faded away. That is until I recently got hold of Della Chuang's latest book, which rekindled my old fascination with Japanese life and tradition. 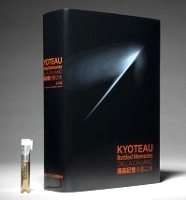 KyotEau: Bottled Memories documents the creative process behind KyotEau (or Eau de Kyoto), a tribute to the author's favorite city. A former art director at Ralph Lauren Fragrances and Tom Ford Beauty, Taiwanese-born Della Chuang tells us about the idea behind the project, its conception, and the hurdles she had to take before it was brought to completion. She reflects on Japanese art, design, culture, and philosophy, and uses her own photography, sketchwork, and correspondence with friends and colleagues to bring these subjects to life. In a cut out insert in the back of the book you'll find a sample vial of KyotEau, created by none other than perfumer Christophe Laudamiel. In the book they discuss the transformation from the original brief to the actual composition of the fragrance, which features jasmine, incense, patchouli, jatamansi, cypriol, and some very elegant soft floral and woody accords. Chuang came up with the idea for KyotEau in a small diner in Brooklyn in 2006, right after she had quit her job. She wanted to explore her talent as a writer and photographer, and decided to pay homage to the city that had been her refuge during her hectic professional years in Manhattan. With a solid background in perfume bottle and packaging design — she worked on Ralph Lauren's Ralph (2000), Polo Blue (2002), Pure Turquoise (2005), and Tom Ford's White Patchouli (2008) — she took on the task to capture the spirit of Kyoto in an all-encompassing perfume design project. Chuang's basic idea for the project was to convey the beauty of Japanese simplicity, which in all fairness sounds like something that's been done before. But KyotEau turned out to be far more inventive than I expected. As Laudamiel explains in one of their discussions, simplicity can either refer to how the product smells, or to its formula; the two don't necessarily rule each other out, since a complex formula can express simplicity, and vice versa. KyotEau is a predominantly clean fragrance with dark woody accents — much like the bottle and packaging — but at the same time it reveals some wonderful exotic facets that are difficult to link to Western smells. It proves Chuang's observation that "simplicity isn’t simple" (p. 100), and reminds us that it takes patience, experience, and talent to achieve the right kind of simplicity in anything you create. The book is a little marvel of contemporary design in itself; with its brick-like shape it has the massive feel of a small bible. It won't take nearly as long to read it though, since half of the 369 pages are in a foreign language (I assume it's Taiwanese Chinese). Many excerpts from the book can be found on Chuang's blog Nomadic Design; I purchased my copy straight from the author last summer, but it is now available at LuckyScent for $40 USD. While it surely cannot replace an overseas trip to Kyoto, this book is no doubt the closest thing to it. Della Chuang is also the author of New York Downtown Style (2006), on New York's avant garde fashion scene, and a followup entitled New York Downtown Style: Witty Design Objects (2007). WANT! This speaks to me as both a budding perfumista and a long-time bibliophile/bookworm. Lovely review Marcello. yeah, i have seen this picture .i love Chuang’s design and her photo,actually ,i really love the articles here,but i am a Chinese boy and now in university, i have difficulty in reading some words,cuz i found they are french.aha, thanks for sharing. does anyone have a photo of the bottle? I thought the sample vial was the bottle… ? It is…the book comes with a sample, not a bottle. Very sleek. Thanks for that. I might have to get this book, it sounds like something I’d love. I’m still wondering what to do when my vial is empty. It’s such a lovely scent to apply on the back of your hand, while leafing through the book. Thanks Marcello, I should not have butted in when I didn’t know what I was talking about! hey, some of it was true though! Thanks a LOT, Marcello! I am Taiwanese and I wasn’t aware of this masterpiece before. Already purchased the book but I want to experience it before I’m stepping on her journey of Kyoto. I want to try attaching my own memories of Kyoto to this perfume first.